There are some political commentators who make a living out of saying incendiary remarks just to pander to certain audiences in order to maintain a career. Tomi Lahren seems to be one of those commentators. Despite radically changing her political views, and being shut down time and again, Lahren still gets work. She has a particular hatred of "snowflakes," even though she displays some snowflake-like behavior herself, if you ask me. Lahren is now back at it again, going on a tirade against immigrants who refuse to assimilate into American culture and learn to speak English. "You don’t just come into this country with low skills, low education, not understanding the language and come into our country because someone says it makes them feel nice. That’s not what this country is based on. These people need to understand that it’s a privilege to be an American and it’s a privilege that you work toward—it’s not a right." However Twitter users pointed out that it's just another case of Lahren being hypocritical, because a look into her own family history suggests that she's living in a glass house and throwing lots of stones. 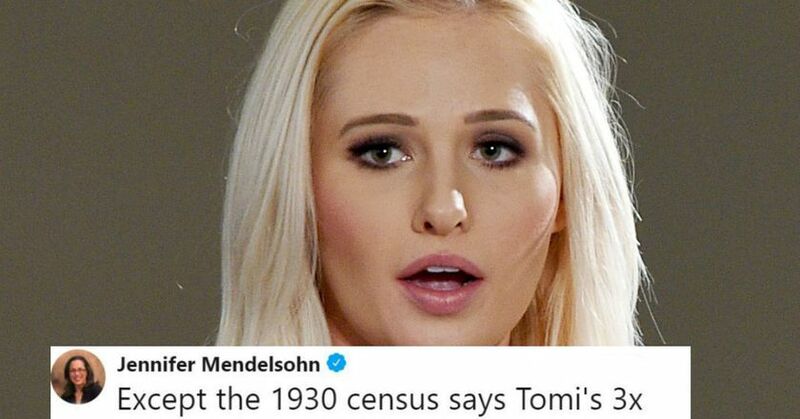 Specifically, Jennifer Mendelsohn, the creator of #resistancegenealogy, a movement designed to show hyper-nationalists and 'Murican "purists" that they're not so "pure" themselves, was the one to serve Lahren up some facts that poked giant holes in her argument. Turns out Lahren's ancestors were here for 41 and 10 years respectively and allegedly, neither of them ever learned to speak English. They immigrated from Germany and Norway only to have Lahren, generations later, secure a net worth of $3 million for herself by preaching that other families should be restricted from the same privileges she benefited from. For Mendelsohn, it's not about "catching" Lahren in an embarrassing moments, it's about making a point that the Americans who immigrated to the United States years ago are seeking the same opportunities that immigrants did years ago. She wants to combat the narrative that the immigrants who came to American years ago were "cut from a different cloth" or had "different intentions" than hopeful immigrants today. They faced the same hardships, had the same dreams, and also faced the same prejudices years ago as well. Take for instance, these anti-semitic, racist ads Jewish immigrants had to deal with when coming to America generations earlier. Or even the discrimination Irish immigrants faced when they came to America en masse. Mendelsohn's point is that America has always been built on immigration and the idea that accepting people from different cultural backgrounds is somehow incompatible with the "American Way of Life" is categorically false. Mendelsohn capped her Twitter thread by finding some common ground with Lahren. There have been tons of instances where Lahren was caught criticizing behavior she was guilty of or benefited from herself, like when she accused "lazy liberals" or wanting handouts. She's been involved in so many "pot-kettle" moments it's getting hard to keep track.